In Traditional Chinese Medicine, we talk about Acupuncture, the Qi, and Yin and Yang. But what do these all mean when it comes to health and disease? The concept of Qi is not easy to explain. It’s not something that can be simply translated into Western concept by liking it to a similar existing philosophy. The term “energy” is often used though this is still only a very general and simplified approximation for Western understanding. Qi is much more than a force which demonstrates its power and purpose to drive matter by movement and direction; Qi also builds strength, calms excess, and allows for change. It is both the instigator and the driver of that change. Chinese ideology will tell us that human life exists only as a continual relationship with our environment, until we die. Hence why Qi is also often referred to as “life force”. Whilst we may believe we are separated from other things by definition of being human versus something else, on a scientific quantum-physical level, our existence is only permissible because our Qi constantly interrelates to the Qi of the universe. Any one thing can only exist because it has a relative relationship with another and so nothing exists in isolation; it is the Qi that allows for the variables of life to work together and thereby defines existence. So how does this apply to health and disease? Consider how much our physical bodies change over time. Every part of us is made up of cells which have a certain life span before they regenerate. The life span of red blood cells, for example, is about 4 months. Bone cells however, regenerate constantly; in fact, we have a totally new skeleton about every 10 years. So throughout this lifetime of continual change, how is it that we still remain the same person? That constant is our Qi. Qi is not something that can be quantifiably measured, especially within health and disease. Western science has found great difficulty explaining it. However, what they have found is that both individual and combined actions of electro-magnetic vibrations control and link the body’s various organs, systems and functions. This interrelationship allows for mutual support and control of all bodily systems. Therefore, if the movement or circulation of Qi of the body is broken, slowed or blocked, then disease or “patterns of disharmony” will occur. Treatment with Chinese medicine stimulates and/or manipulates the Qi bringing about our body’s own self-healing mechanism to thereby “restore harmony”. In Western medicine, anatomy and physiology will tell you that the various networks such as the nervous system and lymphatic system, deliver the necessary materials, messages and nutrients to different parts of the body in order for it to work properly. 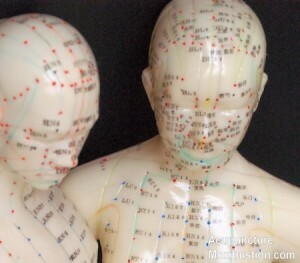 Chinese medicine on the other hand, focuses on another system of channels: the meridians. Unlike Western thought, however, the reality of these meridian channels exist more in terms of function rather than structure. The meridians form a network of pathways that connect the 12 main organ systems. Made up of 12 pairs, plus an additional pair located down the back and the front of the body (14 meridians altogether), they allow for Qi, Blood and other vital substances to flow freely throughout the body. Along each of these meridians are located anatomical points just below the skin’s surface that allow for this flow (or lack, thereof) of substances to be manipulated: the Acupuncture Points. Using super-fine sterile needles, an acupuncture practitioner can adjust and manipulate the body’s self healing mechanism by stimulating and/or manipulating the Qi. He or she may use various points in combination to form a pattern of treatment. What about Yin and Yang? Yin and Yang is the philosophy upon which Traditional Chinese Medicine (TCM) physiology, pathology and diagnosis is based. Perfectly balanced Yin and Yang is complete harmony. Note however, they are not absolute opposing aspects; Yin and Yang are interrelated and reliant on one another, remember, nothing works in isolation. The Qi drives the continual change and movement of Yin into Yang and vice-versa, as well as driving the changes within each aspect of the Yin, and that of the Yang. In Chinese medicine, patterns of disharmony or disease are illustrated and understood with the Yin or the Yang of any certain aspect being out of balance, perhaps one or both is excessive and/or deficient, and this will be illustrated by certain patterns of symptoms. For example, a Kidney Yin Deficiency presentation may manifest weakness in the knees and lower back with tinnitus, low libido, night sweats; a Kidney Yang Deficiency may manifest an aversion to cold with low libido, fatigue, loose stools; Liver Yang Excess may manifest headaches with a dizzy sensation, irritability, a bitter taste in the mouth, for example. Understanding this basic philosophy of Yin and Yang aids the practitioner in the differential diagnosis for treatment. Many Chinese Medicine practitioners still try to force Western thought into traditional Chinese concepts so they can be more easily interpreted. But whilst it can be argued that Chinese fundamental theory lies in quantum physics and therefore “science”, the Western versus Chinese schools of thought in health and disease is so very dissimilar, this Westernised approach at attempting to understand it simply doesn’t work: there is no Chinese Medicine equivalent to, for example, migraine or IBS. Yet these are two Western conditions that can be successfully treated with Acupuncture and Chinese Medicine, but only by using TCM (Traditional Chinese Medicine) differential diagnosis. A practitioner therefore needs to have a true understanding of Chinese ideology to fully comprehend Traditional Chinese Medicine, including how the body is presenting itself, how to assess it’s changes, what the approach to treatment should be, to ultimately yield much better results in clinic.